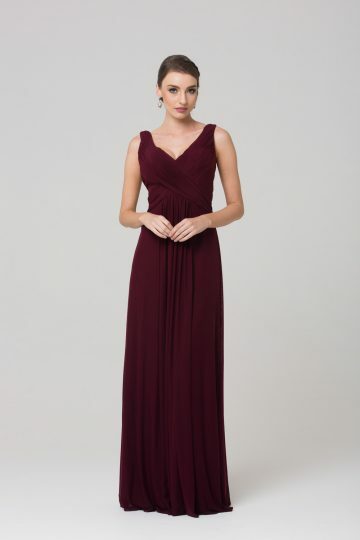 A truly darling piece, Natasha Bridesmaid Dress embraces all things romantic and elegant. Fabricated from a soft crepe, the Natasha style features a V-neck and matching back design with pleated edging. Delicate split off the shoulder straps add a touch of femininity with a slight split in the front skirt for a modern twist. The Natasha is fitted through the bodice, before falling to the floor soft a-line skirt. Designed for the feminine bridal party, the Natasha Bridesmaid is the epitome of elegance and style. The simplicity of this style also makes it a beautiful formal, or evening gown. The gowns cut and design is flattering to a variety of shapes and sizes (6-30). To identify your size see your nearest Tania Olsen Designs stockist and they will correctly measure you and assist with selecting your size.